We love making Thai curries (our go-to brand of curry paste is Maesri, which The BF orders on amazon, and we use all different brands of coconut milk). To make it slightly different this time* around, though, we made the rice fried in the curry sauce rather than just the bed for it. In the end, it wasn’t all that different-tasting from our usual way of making it, but it sure was good! Especially since we had fluffy bits of battered/fried tofu (instead of regular firm/semi-firm tofu that we fried ourselves). *Meal cooked Feb. 2015. 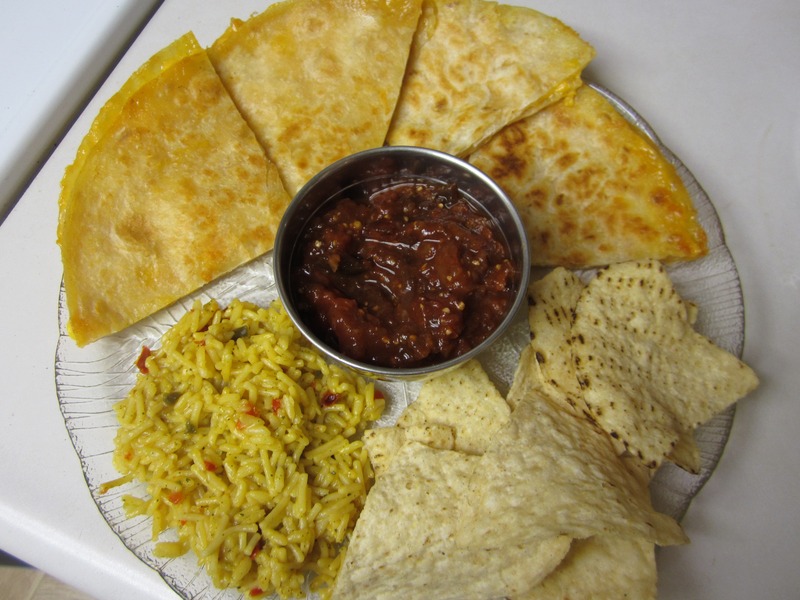 Home-made chipotle salsa and chips for dipping–plus Spanish rice (store-bought mix), and quesadillas (I’m saving the details of how I make my quesadillas for another post…) The chipotle salsa recipe is from from wikihow. Ours was a little different, though, in a bad way and a good way: The bad way is that we forgot to buy cilantro. Tragedy! The good way is that, instead of just using “1-2 teaspoons adobo marinade from canned chipotle chilis” we used more than half of the entire (tiny, like 6-7 oz?) can, and by that I mean INCLUDING the peppers themselves, pulverized in a food processor. All in all, it was pretty tasty for a “lazy” dinner! 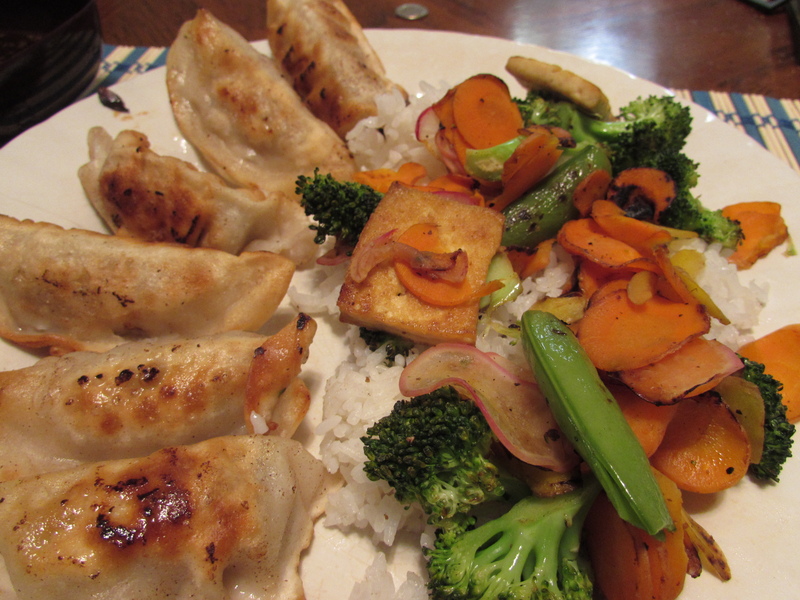 Remember when I said (in Dec. 5th’s post) that gyoza, veggies, rice and dipping sauce were a standard go-to meal for us? 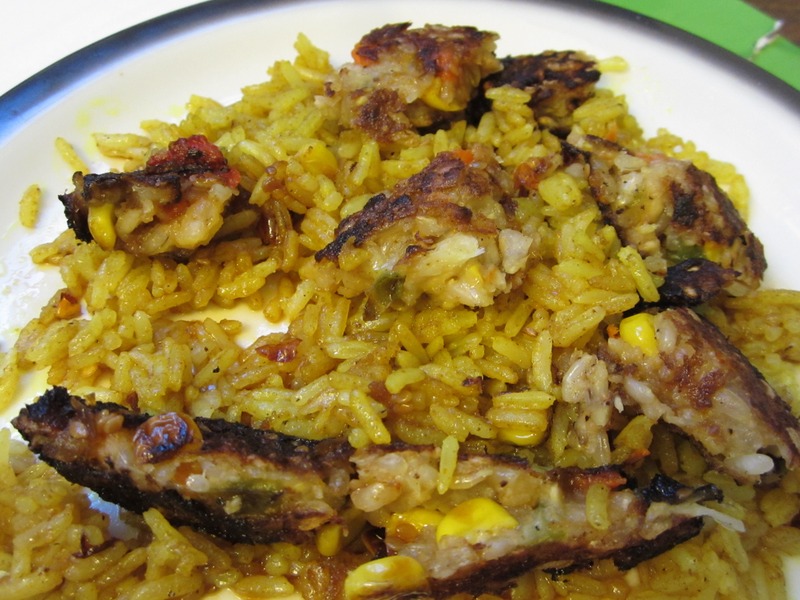 Well, it’s even better (for your wallet and for the world) when you can incorporate leftovers. 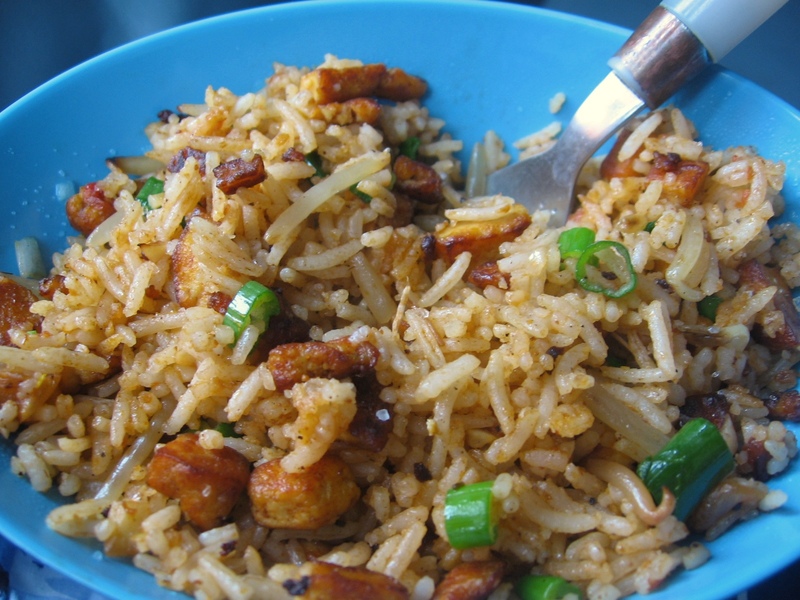 If you eat rice and veggies often, there will always be something on hand! Here we were able to use up leftover jasmine rice and bits of already-fried tofu from a curry meal three days ago (we had made too much tofu) + snap peas, sliced carrots and sliced radishes left over from a big salad. Delicious! And now we know that you can saute radishes. 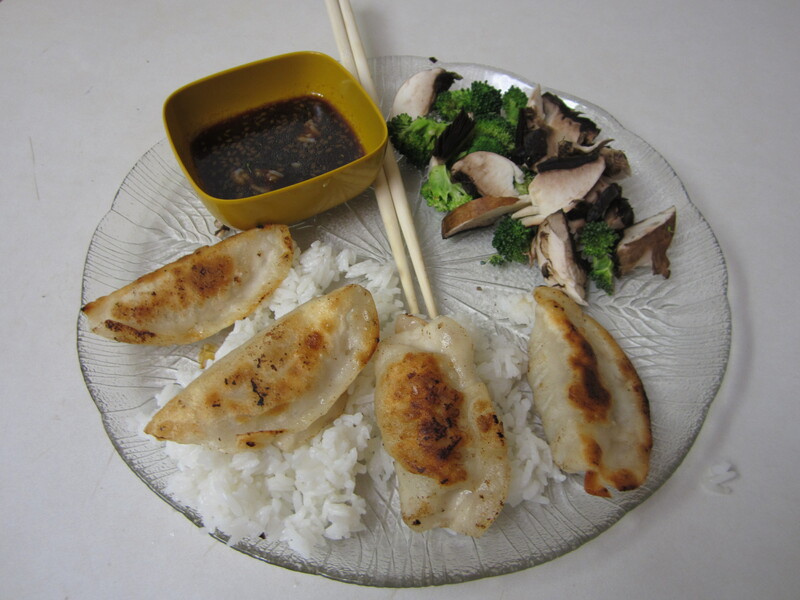 This is such a go-to meal for us: Gyoza (I prefer pork-and-cabbage or stinky seafood ones, myself, and The BF goes for vegetarian ones), rice (our default is jasmine rice), whatever veggies we have one hand (lightly steamed and sometimes with things like soy or vinegar or garlic on them) + a dipping sauce (typically, soyaki sauce from Trader Joe’s). For cheaper gyoza (and greater variety), try an Asian grocery store like 99 Ranch. For a few weeks before we moved to a new city, we did this thing where we kept grocery shopping minimal, saying we weren’t allowed to buy anything to buy anything except stuff that would help us use stuff we already had. I highly recommend you try this, whether you are moving or not! Just for a week or two. It resulted in me realizing that I had a *ton* of food to eat, *and* made me more creative in how I used it. This is a “Malibu burger” (veggie burger; a housemate gave us a bunch of them, so yay for free stuff) chopped up and mixed into The BF’s patented “curry rice” (white rice leftovers seasoned with curry powder, cumin, hot pepper flakes, garlic, salt and pepper, and a little soy), with Soyaki sauce (Trader Joe’s) drizzled over it all. Very tasty and super-quick.